Proteus VFX School offers different kinds of courses depending on your need and the learning/career path you’d like to follow : Workshops, Introduction courses and On demand Workshops. Introduction courses are useful for those who want to start learning computer graphics and 3D topics, we’ll teach you basic theory and main techniques and tools about choosen software. On demand Workshops are pre-recorded courses delivered on Vimeo On Demand platform, lower price, same quality and strong support, gives you the possibility to watch it when and where you can. Workshops are intensive courses, if you have basic knownledge and you’d like to have higher skillset or you have production experience and you’d like to reach higher career goals, you can choose between our workshops related to a 3D software or a plug-in. Our courses are online based. Below you can check our current training program offer. For any questions or concerns please contact us : info@proteusvfxschool.com. We don’t care talking about every single features, we prefer teaching a working methodology. Lessons are based on projects so students can study making direct experience on real world problems using a production proven workflow/pipeline and developing their technical and artistic skills. This way of learning gives you the possibility to prepare great stuff for your personal reel/portfolio before the end of course. Our learning path is intensive, student feeld computer graphics around him since the beginning. Lectures are mixed, part of it is based on theory, part on practice and project-oriented, so it will be impossible to feel distant from production and future job. Shots and tasks are assigned to students, instructors will support everyone like in a real production team. 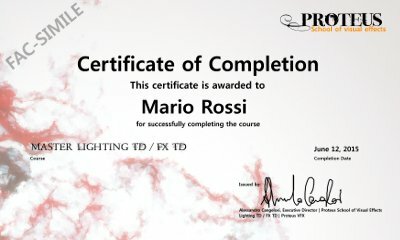 Proteus VFX School was created by artists, TDs, developers and animators, we can offer a different way of learning and studying, an amazing door to start your business in VFX and computer graphics. Having a low number of students in the classroom is a good solution to be able to follow at the best everyone and keeping the “studio-like” feeling we love. A VFX team is made of synergies between the individual, understanding each one skills, sharing knownledge, the only way a team can achieve excellence, we like to gives you these lessons of team working because it is one of the most important thing for your future. Learning path is based on a production proven pipeline/workflow. We’ll prepare lessons using same techniques, tools and features used by us in production, it will evolve to accomodate industry and clients, it will evolve with you. Lessons are prepared depending on industry, but we are taking care about your knownledge, your skills to be ready for future production you’ll be involved and we’ll work hard to be sure that transition from education to future job will be simple. At the end of our courses you’ll receive the Proteus VFX School Certificate of Completition. Where provided, we’ll release certificates by software developers. Our teaching project goes further than certification, we believe that most important thing is to give you the right training, tips and tricks to be able solving production problems, we’d like to give you part of our experience and skills. Your expertise and your artistic and technical skills, are the best value for us and the market. Your knownledge, your skills, our professional experience, and all excercises done together with us, this is what Proteus VFX School will gives to you.